Try our gorgeous coconut cake drizzled with zingy lime icing - perfect with tea or packed up for a picnic! 1. Preheat the oven to 170°C, (150°C for fan ovens), Gas Mark 3. 2. Whisk the cake ingredients in a large bowl until pale and creamy (use an electric hand whisk if you have one). Pour into the tin and bake for 55-65 minutes spring and cooked through. (If the top becomes too brown cover the cake with a piece of parchment). Cool the cake slightly then remove from the tin to cool completely. 3. 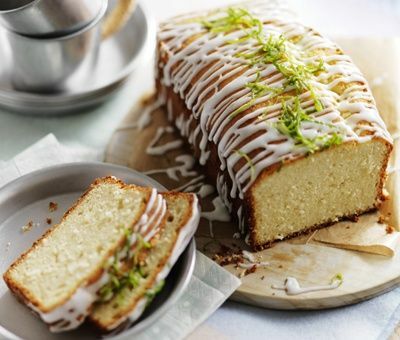 For the icing – simply mix enough lime juice into the icing sugar until you have a thick pouring consistency – drizzle over the cake using a spoon or piping bag and finish with strands of lime zest. For a super fresh taste – microwave a slice of cake for 10 seconds to have that warm from the oven effect! Recipe contains gluten, eggs and milk. Hi Brenda, Carnation Light Condensed Milk is a good substitute in almost all of our recipes. It works beautifully in the particular cheesecake. Novice at loaf cakes..tried this one using two limes as per suggestion to ma bakers problem.. Worked out ace ! Definately needs the two limes and covered over about 20 mins before finishing cooking (but my oven hates me so that could be just me) lovely cake real easy and not too sweet !! Yay...thanks Carnation ! Made this several times and passed it on to my daughter who loves it as well. We do use extra lime zest for a bit more flavour. We would really like your opinion on how well this mix would be in cup cakes. I'd like to make muffin sized ones and fill with a lime butter icing but not sure of the oven temperature (fan) or baking time. Can anyone help? Hi Kat, they would make very sweet individual cakes. Our recommendation would be not to change the cooking temperature rather reduce the cooking time by approximately 5 minutes. Bake until springy to touch. Cooking temperatures vary between ovens and so will the times. I have searched your website for a recipe to use the 150g (almost) condensed milk leftover from a 397g tin but have not found anything. Can you suggest a recipe? If not, can it freeze? Hi Ivy-Alice, Next time you have left over Carnation Condensed Milk you could try Red Berry Meringue Mess or Bread and Butter pudding. These recipes will both work well if you reduce the Carnation Condensed Milk in the recipe to about 150g. Made this for the first time today. Easy to make, browned nicely (I did cover loosely with foil after 45 minutes and cake done at 55 mins). Nice texture but can't taste the lime in the cake at all and although I like coconut the cake tastes quite bland. I wouldn't make again. Hi Ann, sorry to hear you were disappointed by your cake. If you prefer a zingy treat why not add a the zest and juice from a second lime? Used toasted coconut and caramel condensed milk to make the lime and coconut cake. Makes a delicious cake, goes down well with at my jewellery making class. Hi Sue, sounds wonderful. We love the exotic flavour combinations will have to give it a go! where can i buy the cheese slicer used in this recipe to peel the lime also the small grater? Hi Jean, you can find very fine graters in all good kitchen shops and if you want strips of zest you can do this with a very sharp knife - cut a strip of zest and use the knife to remove any white pith, then very finely shred. Alternatively buy a zester from good cook shops and supermarkets. Hi Jean! So glad you liked it! Try our Lemon Drench Cake which is also lovely or maybe our Chocolate Fudge Cake if you love baking? Just made this cake, and it was absolutely delicious. As easy as stated, quick moist and very tasty. I left of the icing as i thought it might be too much but it was just as nice can truly recommend this recipe. Lime and Coconut Cake is rated 5.0 out of 5 by 6. Rated 5 out of 5 by Jantony from Showstopper !!!! I have now made this so many times and it has always been amazing, So today my husband asked if we could have it as buns instead and it has worked out a treat. Perfect for picnics or lunchboxes......there is not an occasion that this cake doesn’t serve. Rated 5 out of 5 by Mable from Easy peasy and scrummy yummy I am a dreadful baker! I have an amazing skill where almost anything I attempt turns out terribly! Not this time! This is amazing. An easy receipe with delicious results. Mine may not be the prettiest but it mighty tasty. I’m so impressed! Rated 5 out of 5 by Elizabeth from Great loaf I made this today and it turned out really well. Took less cooking time than the receipe said but it bouced back when I pressed the to see if cooked. Will be adding this one to my receipe book. Rated 5 out of 5 by linda123 from fabulous bake a cake once a month and give to people, it makes them smile, made this and they thought it was brilliant, why dont you make a fabulous recipe book?? ?